As it pertains to gas turbine engines, it is the parameter that is the difference between the operating RPM and the RPM at which the compressor blades will stall at any altitude and for transient slam acceleration. Your target airspeed in turbulence--or when you suspect turbulence--should be 20 to 25 knots below the published VA or VB speed as adjusted for weight, or halfway between the weight-adjusted turbulent air penetration speed and Vsi, whichever provides a greater stall margin. According to Norm Cotter, full-scale testing of the original J58 compressor revealed the lack of sufficient stall margin at the higher Mach numbers. However, performance studies done by FRDC engineer Bob Abernethy showed that for a J58 application requiring continuous high Mach number afterburner operation, ducting compressor bleed air directly into the afterburner not only eliminated the stall margin limits, but it also provided better engine performance. 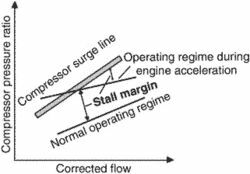 A properly arranged gas injection near the blade tips has proved to increase axial compressor stall margin, leading to a relatively wider operating range and a better operability. To reduce the risk of inadvertent stall/departure resulting in LOC accidents, the GA community should install and use AOA based systems for better awareness of stall margin," said the General Aviation Joint Steering Committee (GA-JSC) panel report focusing on LOC accidents in approach and landing phases. After P&W experts in Hartford had reviewed the data from each test flight, their engineers would further modify the stall margin as appropriate, and we would fly again to perform the same maneuver to evaluate the change to compressor stall boundaries. In other words, fuel consumption (SFC) increased with greater stall margins, so we had to balance increased SFCs vs improved stall margin. Recalibrating to the clean configuration Vs1 as opposed to the dirty configuration Vso should provide ample (30 percent) stall margin in the clean configuration, and additional (more than 30-percent stall margin in the dirty configuration. Instead, establish a Vy pitch attitude on leaving the ground, and climb out at a shallower angle for a greater stall margin.